Investors are increasingly asking fossil fuel companies about how their strategy reflects climate risk. The Task Force on Climate-Related Financial Disclosures (TCFD) recommends testing the robustness of investments in a climate scenario. Often, such stress-tests use the International Energy Agency’s 450 Scenario (450S) or its replacement the Sustainable Development Scenario (SDS). However, as we show in this briefing, these scenarios fall short of the Paris goals. Such scenarios may give a false sense of confidence of portfolios’ robustness, or that the Paris goals can be met with limited change in investment practice. Investors testing their portfolios against the SDS would be potentially undervaluing climate transition risk. The SDS emissions profile matches that of the Copenhagen-era 450S, which aimed for only a 50 percent chance of keeping warming below 2 degrees. The IEA’s Beyond 2 Degrees Scenario (B2DS) is a welcome step in the right direction, but cannot be seen to be fully aligned with the Paris goals. It ignores the goal of 1.5°C, and relies on the availability of unproven technologies such as carbon capture and storage and negative emissions. 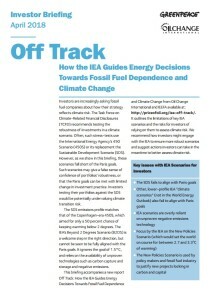 This briefing accompanies a new report Off Track: How the IEA Guides Energy Decisions Towards Fossil Fuel Dependence and Climate Change, from Oil Change International and IEEFA. It outlines the limitations of key IEA scenarios and the risks for investors of relying on them to assess climate risk. We recommend how investors might engage with the IEA to ensure more robust scenarios and suggest actions investors can take in the meantime to better assess climate risk.